The major Italian lakes of note, are generally Northern based, with some breaching the Swiss border. Many will be familiar to frequent travelers or lovers of Italian culture. There is Lake Garda, Lake Maggiore, Lake Iseo, Lake Lugano and of course Lake Como, where the old Italian money has family villas and the “nouvea riche” and famous have become attached. But what can you expect when you wish to stay in a luxury villa? What sort of design or ambiance, what type of amenities and cultural positioning. In recent years there has been a flurry of building activity on all lakes as people created second homes and hospitality businesses. Italians have a flair for design and detail and this has never been lacking in their architecture. You have to go back a long way to understand the eclectic mix: Lake Como for example has 56-square-miles of lake and mountains on all sides, so plenty of lakeside and stunning panoramas. As an example in the 16th century, a cardinal named Tolomeo Gallio built on its shores, in what is now Cernobbio, an opulent and elegant residence, the Villa d’Este, which is now one of Europe’s top hotels. Villa Erba in Cernobbio was owned by the Visconti family. Villa Carlotta as built at the end of 17th century by the Marquis Giorgio Clerici from Milan. Villa Monastero in Varenna, was built on the ruins of a Cistercian convent and has wonderful lakeside gardens. Villa Melzi was built in 1810 for Francesco Melzi d’Eril (1753-1816), the Duke of Lodi and Vice President of Italian Republic. Villa Cipressi is not that old (late 19th century), but the actual land has been the property of a number of well known “Italian” families for a thousand years; the Serponti family (1163), Baron Isimbaldi (end of the eighteenth century), the Andreossi family, Sir Astley and Sir Salton (early 20th century). All these, now public villas, all have lakeside locations, big architecture as its framework with massive splendid gardens. This type of design has drifted down to older but smaller villas that adorn the lakeside and are often now available for rentals. These are furnished in traditional almost antique ways. In fact one of the most prestigious billionaire weddings of all time happened the first month of opening with Spotify CEO Daniel Ek’s wedding on the lawn of Villa La Pliniana, (image above) actor Chris Rock officiated the upbeat ceremony, Mark Zuckerberg supported his friend and Bruno Mars performed. Doesn’t get much grander than that. If you go further back the Romans too had quite an influence with its network of ancient Roman roads such as the Antica Strada Regina and the Sentiero del Viandante (the Wayfarer’s Trail), overlooked by towers and castles, was the route for trade and exchange of culture between Como and the area north of the Alps. Although Roman buildings are not evident the cultural history permeates the whole area. Rip forward hundreds of years and we see Italian Rationalism which was an architectural trend which developed in the Twenties and Thirties. Based on the principles of functionalism, it accords buildings the appearance to which it must clearly reflect the purpose for which it is created. Some of these building can be seen in Como city not too far away from the fabulous Duomo. 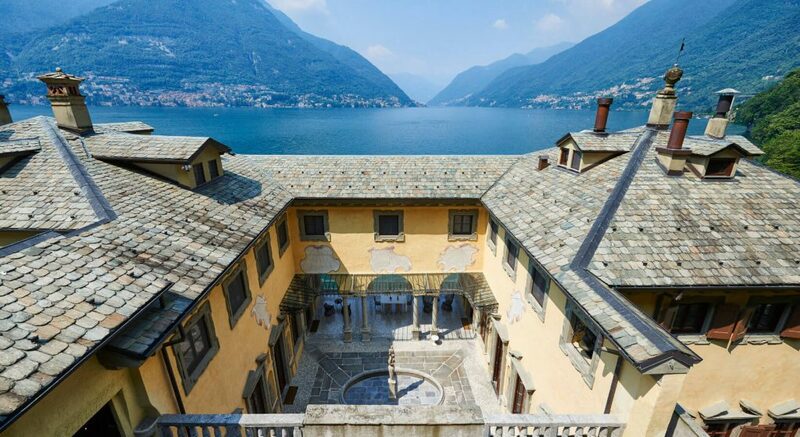 Today however we see celebrities buying villas (George Clooney in Laglio for example), who modernize to an extent, but we also see magnificent renovations and creations using modern architecture to take full advantage of both water front positions and mountain side views across the lake and sub-alp region.